This website is a window on some of the things that I like to do and some of the things that interest me, I hope you also find it interesting. 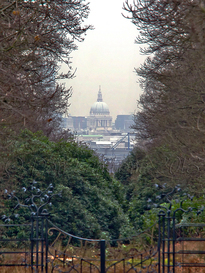 The picture on the left is of St. Paul's Cathedral, it was taken from King Henry VIII mound in Richmond Park, a distance of 10 miles, It was an overcast day with St. Paul's just visible to the naked eye, the camera was tripod mounted and set to manual control, focusing was done by hand using Live-View and the camera was triggered by remote control. Only basic adjustments like levels, brightness / contrast and a little sharpening etc. have been done to this image, (some cranes were also removed) it is not a composite image. Click here to view my images on 500px.